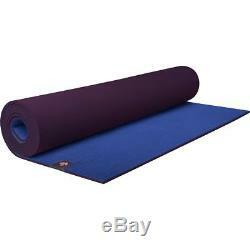 Manduka eKO 5mm Yoga Mat Haze, Standard. Remaining present during yoga practice is difficult enough, so don't make it any harder on yourself by having a mat that hurts your wrists, knees, or conscience. The Eko Yoga Mat from Manduka is a comfortable, cushioned mat made of non-Amazonian natural tree rubber that's 99% latex-free and without any PVC or toxic, non-biodegradable glues, so you can stay in svanasana without stressing your joints or the environment. The closed-cell top surface is cushioned and moisture-resistant, while the grippy bottom layer prevents wandering mat syndrome and can be used as the mat surface if you need a gripper platform for difficult poses scorpion pose, anyone? Best of all, once your Eko reaches the end of its long life, you can dispose of it knowing that it's completely biodegradable and non-toxic, so you're leaving the smallest impact possible. Material: natural tree rubber, biodegradable cotton and polyester. Dimensions: [standard] 71 x 26 in, [long] 79 x 26 in. We get people who get outside - plain and simple. Backcountry began in 1996 with two guys and a stack of avalanche beacons in an apartment in Park City, Utah. Our roots were humble, but our vision was clear: to provide the best outdoor gear to connect people with their passions. Sometimes, even the path less traveled can feel well worn, so we make our own way. We owe it to ourselves and our customers to be innovative, to take risks, and to reach remarkable new territory. We have deep roots in Utah, and we thrive on the trails and in the mountains surrounding Park City. Our corporate headquarters sits just north of old town Park City and within a quick pedal or a few footsteps of the Wasatch mountains. We will not accept the return of gear, bikes, or bike frames damaged due to negligence or abuse. You'll be given the option to select a reason for your return and space to fill in more details. Please provide as much detail about your return as possible. Exchanges only require a few minutes. Immediately placing a new order ensures that you'll get the new product quickly and that it won't go out of stock while you wait. These options are available for eligible U. This receipt also serves as paperwork necessary for your return. Bikes, kayaks, & car racks - No PO Boxes. It's our goal to answer all of your questions and to help you find the best products to meet your needs. 8pm MT by clicking this link. This listing is currently undergoing maintenance, we apologise for any inconvenience caused. The item "Manduka eKO 5mm Yoga Mat Haze Standard" is in sale since Wednesday, September 20, 2017. This item is in the category "Sporting Goods\Fitness, Running & Yoga\Yoga & Pilates\Mats & Non-Slip Towels". The seller is "backcountry" and is located in Salt Lake City, Utah.